LEASING A LOCATION --- Here is Charlie Chaplin at San Pedro, site for scenes in Modern Times. 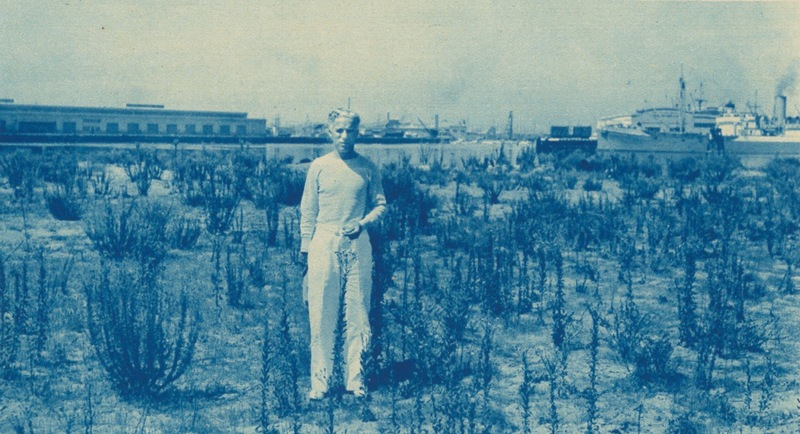 He's rented a four-acre lot at Terminal Island in the dock district, according to captioning I found in a British fan publication. Is this where CC built the shack he and Paulette Goddard occupy in Modern Times? People had begun to wonder if they were shacking up together offscreen as well, and if same had been blessed by clergy. I've noticed other stills of Chaplin in casual wear similar to this. Looks comfortable. Probably an outfit for tennis play. It's easy forgetting years CC took off between pictures. He'd have had much time for tennis and travel. Did he rent his lot to other users during the 30's when space was inactive? By 1936, his public was accustomed to three to five season breaks between CC visits. 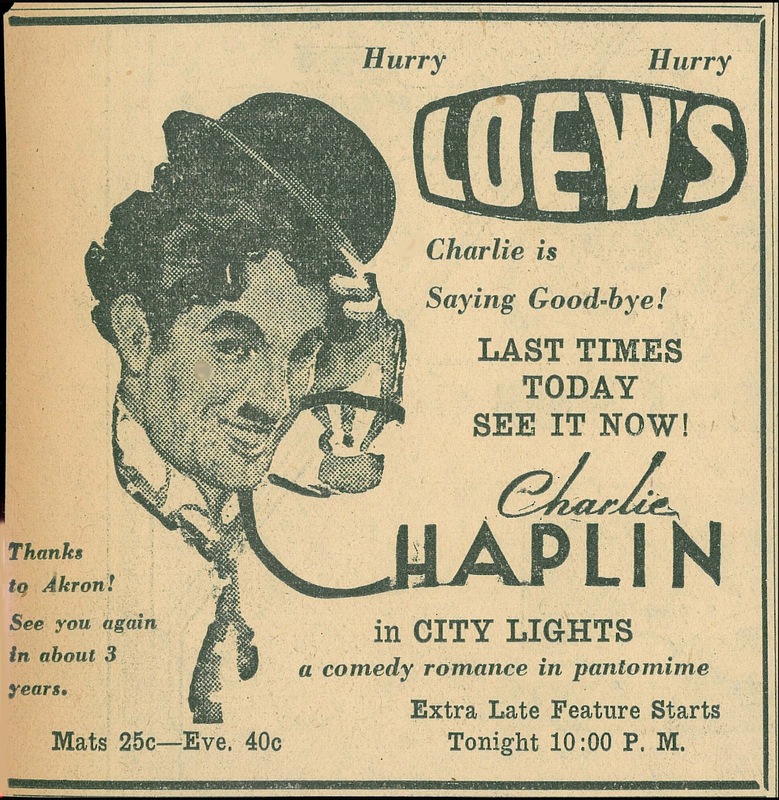 Here's a City Lights ad from 1931 where management captions Charlie's smiling visage with "Thanks to Akron. See you again in about 3 years." Fans knew the score. 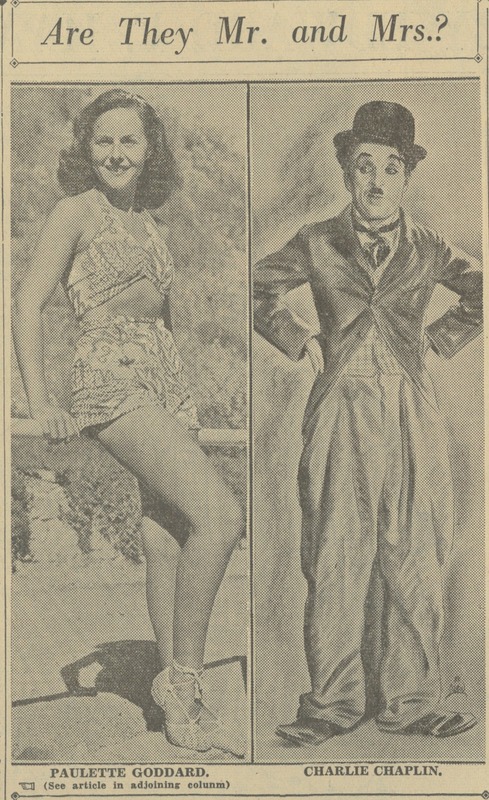 Chaplin took time to make his features, but it was agreed he was worth the wait. As to Modern Times, I've come around to thinking it the greatest of sound movies, even though it doesn't talk. MT and CL used to show up a lot around North and South Carolina from 1972-75 or so when Columbia distributed them. Even small towns took a chance on bookings. I'd cut college class to drive wherever the pair surfaced. Showmen probably hoped Charlie might do as well as old Marx Bros. comedies. They're probably the earliest titles that play in my mind's eye as theatricals rather than TV or home video. Is Chaplin still formidable among past clowns? It didn't seem so the 10/2010 weekend I traveled to Durham for a sparsely attended CC festival. Are his heirs able to live off revenue from the inventory? That surely would have been Chaplin's intent, or maybe not. 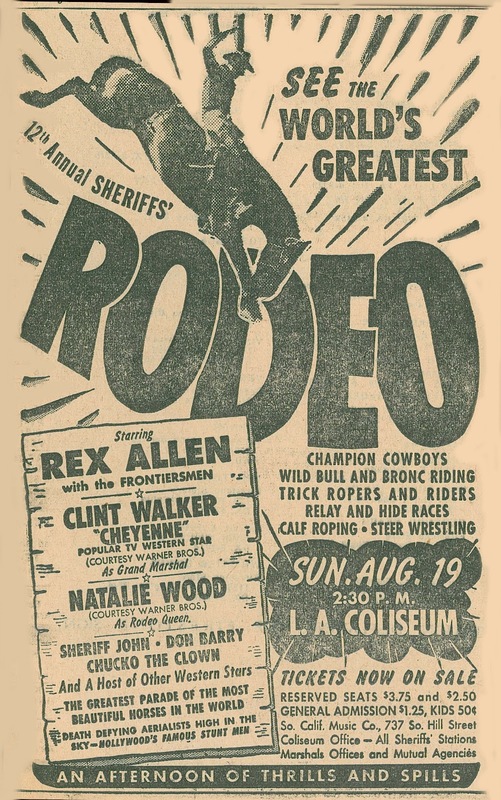 STARS IN THE SADDLE --- "The Nation's Biggest One-Day Rodeo" was said to be this August 19, 1956 event, which among other things, pitted Hollywood cowboys against real life saddle and bronc busters for $12,500 in prize money. So who among the "Host Of Western Stars" rode opposite working cowboys and ropers besides billed Don Barry? Were there former B series stars hopeful of cash gain via compete with on-the-level steer wrestlers? Rex Allen and the Frontiersmen entertained with song. From L.A.'s Channel 7 came Chucko The Clown. He was a local institution from 1955 to 1963. Chucko wore a spinning, merry-go-round hat and an Elizabethan collar with big blue pom-pom buttons on his striped costume. His hour-long TV show was daily and live. The rodeo was put on by the Sheriff's Relief Association, and 74,500 attended. A biggest lure may have been Cheyenne's Clint Walker and teen-dream Natalie Wood, he as Grand Marshal and she the Rodeo Queen. "Courtesy Warner Bros." probably translated to WB currying favor with county law enforcement, which only made civic sense. Stars and staff might, after all, get into jams now and again that needed fixing. A FIRST BOGART AD SIGHTING? 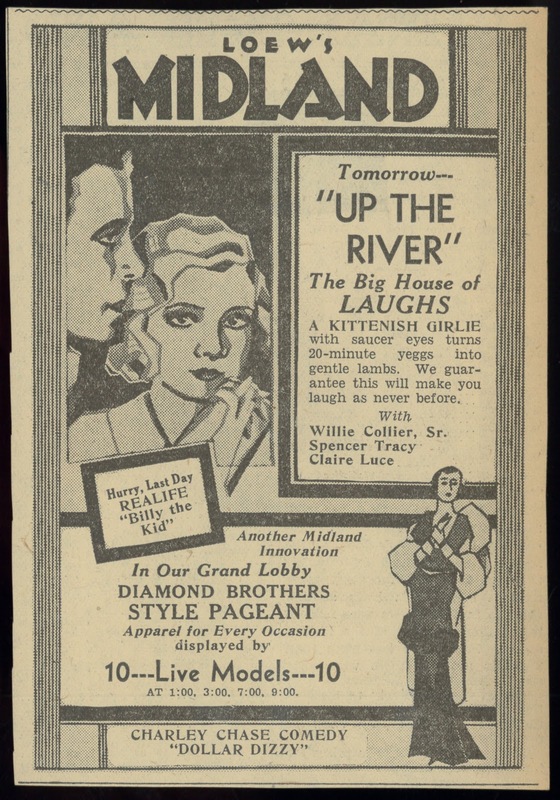 --- I'm tempted to say this is the earliest film ad around showing Humphrey Bogart. Up The River was his first feature. Could there have been illustrated print ads featuring him in earlier short subjects The Dancing Town (1928) or Broadway's Like That from 1930? (upcoming Capitolfest, scheduled for August, is playing The Dancing Town from UCLA's Archive). The date for this ad is 10-23-30, from The Kansas City Star. Bogart's image is unmistakable. That's presumably Claire Luce he's with. The Loew's Midland was just coming off a run of Billy The Kid in "Realife." I'd assume this was 35mm rather than the 70mm also used for BTK (still trying to determine if, in fact, there were any actual playdates for Billy The Kid in the larger-gauge). The lobby's "Diamond Brothers Style Pageant" was typical of tie-ins wherein a theatre and local merchant would team to mutual benefit, common areas being large enough in urban palaces to easily accommodate a fashion show with ten (or more) live models. Going to the movies in 1930 gave you lots more than merely what was on screens. Yes, the Chaplin Studio was rented out while its master was otherwise occupied. Check out Harry Langdon's 1932 Educational short THE BIG FLASH and you'll see the shops built for CITY LIGHTS.